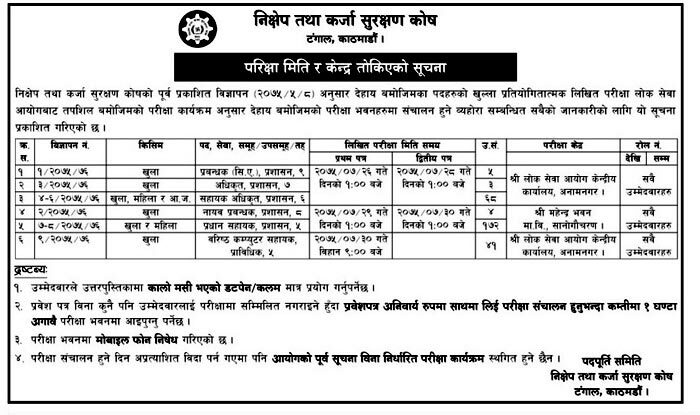 Deposit and Credit Guarantee Fund (DCGF) has published the written exam routine and exam center notice for various positions in both open and inclusive category. The examination will be conducted by Lok Sewa Aayog (Public Service Commission). The examination starts from Kartik 26, 2075 (November 12, 2018) in below exam centers and time. Candidates should present themselves at least one hour before the examination with admit card.